Posted on January 31, 2018 at 4:18 pm. 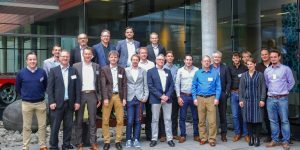 On November 7 and 8, representatives from all 11 Hyb-Man partners gathered in Bremen for the second consortium meeting, hosted by Fraunhofer IFAM. In a positive and constructive atmosphere the partners discussed status and progress, revisited the plans and expectations from the partners expressed at the kick off in April, and prepared for the first progress report. In the mean time this progress report has been submitted and accepted by the Penta program office. Participants Hyb-Man Consortium Meeting in November 2017 at Fraunhofer IFAM, Bremen, Germany. The first day was at the Fraunhofer IFAM site, where apart from the meetings we were able to see the Fraunhofer labs and infrastructure for the development of hybrid materials and hybrid processes for additive manufacturing. Main topics of day 1 were the prototypes and technologies that will be realized in the project: the product specifications for the two use cases are described and translated into requirements for the materials, processes and metrology, as well as challenges for the modeling. First results from 3D printing electronic and structural materials were shared and plans for next period aligned. To balance the future looking nature of the project, in the evening we had the chance to look back into the history of Bremen in a guided tour through the old city center. On day 2 we were able to continue this merge of past and future: surrounded by the history of traditional (cotton) materials and fibers in the Baumwollbörse, we discussed new AM materials and filaments. 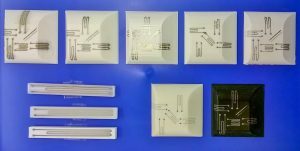 Main topics were the modeling activities to create better product and process understanding, needed to achieve first time right design and manufacturing. In addition we covered the exploitation and dissemination activities and general project items. 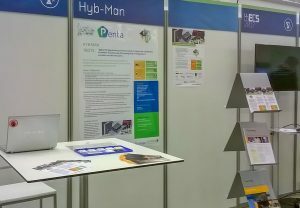 During the meeting, the project flyers and project posters were shared with all partners, and shortly after the meeting our Hyb-Man website went live. In conclusion nice results and good progress in line with the plan, discussed in an open and constructive atmosphere, giving good confidence for the next phase of the project.